If somebody from the workstation with the defined IP (and suitable Netmask) accesses a protected page, then no login is required - the specified member is logged in automatically. 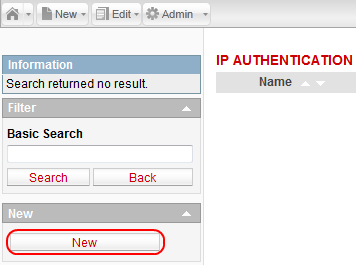 By going to Admin -> IP authentication you will be directed to an overview page listing all the IP rules. You can edit an IP rule by clicking on the Edit icon near the desired IP rule name in the list OR by clicking the New button in the Tools section of the page. 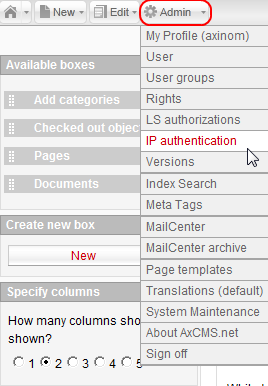 The overview page contains the Filter section, and the New section with the New button for creating a new IP rule. This opens the detail page where you can enter or edit the parameters of an IP rule. You can specify the Name, IP-Address and Netmask for each rule and map the rule to a member. In the IP address field the IP address of a member should be entered. Corresponding member should be selected as Associated user. IP of the user can be found by using ipconfig command in cmd line of the user's system. Notice that a correct IP address or Netmask value may not be bigger than 255 and correct format is „<number>.<number>.<number>.<number>“.